Note: We left the same day that the issues started in Palestine (Israel vs. Gaza) as well as in Jordan (protests over massive increase of gas prices, which led to dissent against the king). In other words, we had no idea we’d be going at the same time as these problems. If we had known we probably would’ve postponed our trip. However, I’m really thankful to have been there at that time because it exposed me to so much of which I would have otherwise been oblivious. 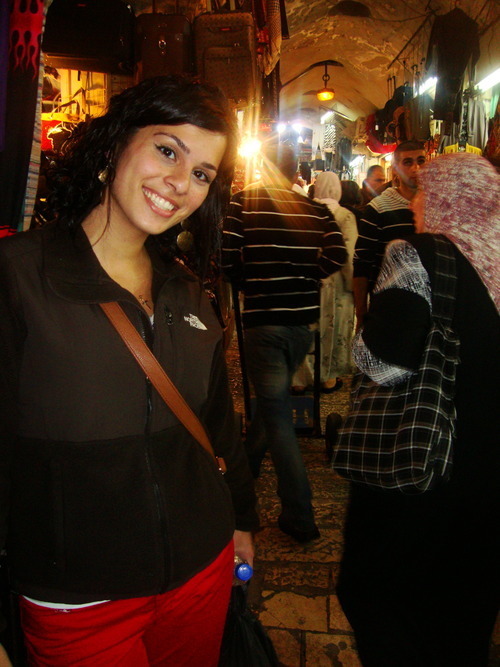 My friend Summer and I left Amman in the morning and got to the Israeli border at around noon. 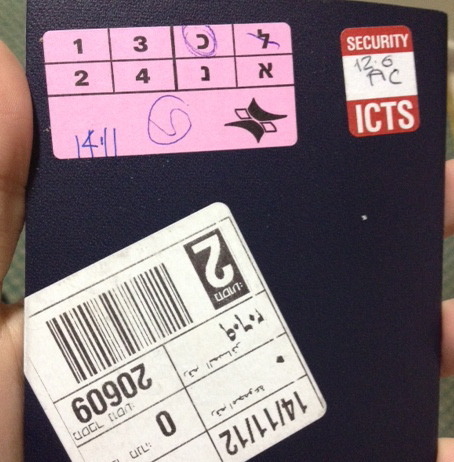 The first person who checked our passports immediately put a certain sticker on them which meant we would be interrogated. Why? Because we have Arabic names. After going through security we were made to wait until an Israeli guard called us individually to interrogate us, while all the other foreigners passed on quickly and smoothly. We were asked lots of questions. Lots and lots of questions. Why are you going to Israel. Which cities are you going to and why. Do you know anyone in Israel. What did you bring with you. 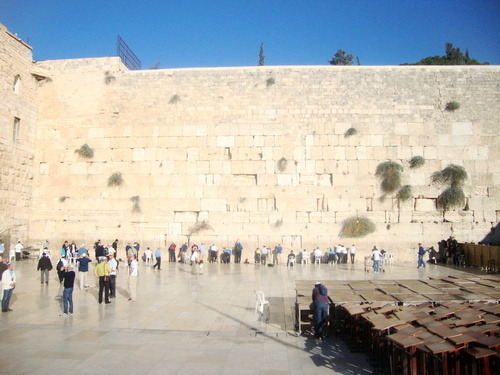 Do you have family in Israel. (We said no, because if they found out I had Arab relatives in Palestine they would have made our entry even harder.) What are you doing in Jordan. Who are you staying with in Jordan. Where are you living. What are you studying and why. What did you do in the States. What do your parents do. Etc etc etc. Then, once we passed that, we went to the next checkpoint but they took our passports again and told us to wait. So we waited. And waited, and waited. For three hours. (Which is really not that bad, considering other stories we have heard at the border.) Why? Because quite honestly, an American passport – the passport of all passports – means nothing to the Israelis when you have an Arabic name. 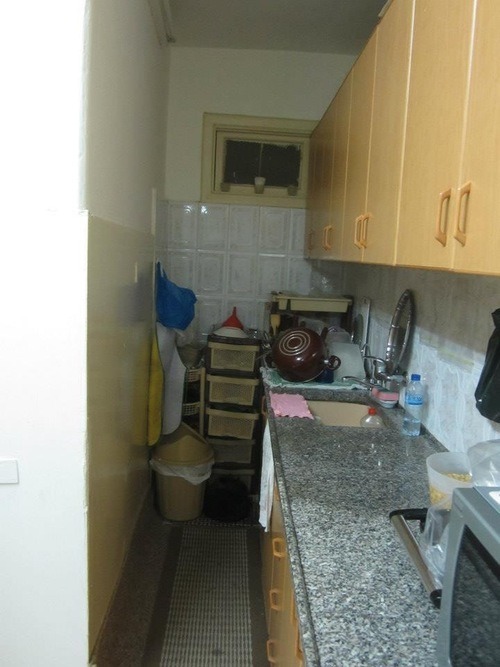 We also made three friends who were in our situation: one was a British guy who had a Syrian stamp on his passport; another a Dutch girl also with an Arabic name & roots; and finally another girl who, though she worked for the UN and had a permit to be in Palestine, was also an Arab. While waiting we decided to take some pictures. After a few minutes an Israeli officer came up to the people sitting next to us and said, “Show me your pictures.” They said they didn’t take any (and didn’t rat us out – faithful neighbors). The officer didn’t believe them and asked to see their phone, and proceeded to scroll through their photos in an effort to delete any they may have taken. I’m tempted to post the photos we took here but they’re illegal so – yeah. Success, though. Long story short, after coming out of the border we took a bus to Jericho, and then from there a bus to Ramallah. We arrived at my aunt’s house in the evening. 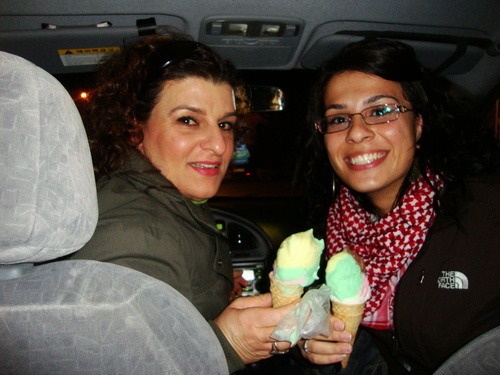 She and her family are truly incredible – they fed us amazing food, took us around to see a little bit of Ramallah in the night, and bought us the most amazing ice cream that even my dad still remembers. During the course of this day, Israel had been bombing Gaza, so naturally Palestinians across the West Bank were coming out in protest. We saw the beginnings of a protest on the streets of Ramallah, and then at home that night watched it intensify on the news. 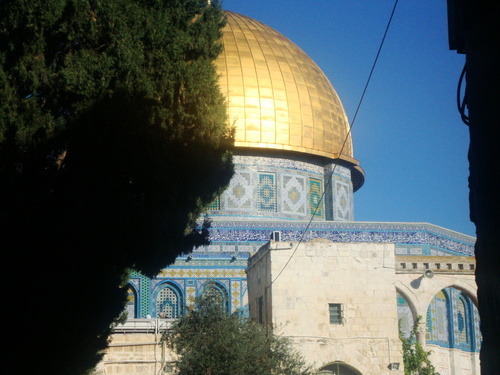 Jerusalem. My aunt wanted to come with us really badly. Unfortunately Palestinians aren’t allowed out of the West Bank, so, even though she is really Jordanian (married to a Palestinian), she couldn’t accompany us. We had to pass by a checkpoint between the West Bank and Jerusalem. An Israeli soldier armed with a huge gun came onto the bus, and without a single word, intimidatingly checked everyone’s passports and then left. 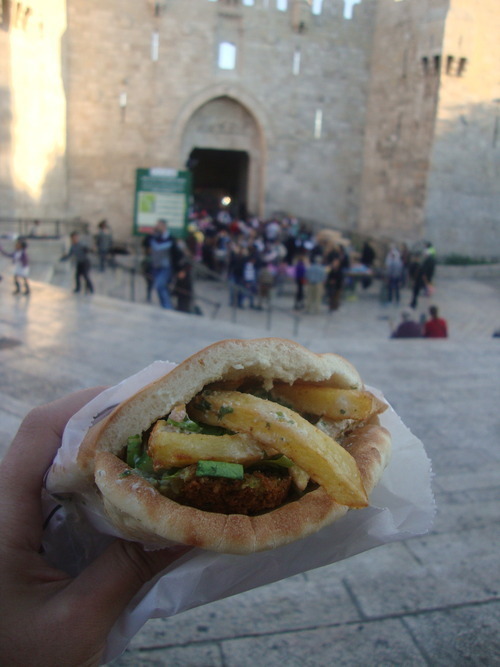 After this, we bought really amazing falafel sandwiches off a street stand. That night my family took us out to dinner, and all the while we were hearing of more bombings going off in Gaza and more uprisings occurring throughout Palestine. Jordan was still experiencing her fair share of street protests as well. Summer left back to Jordan early in the morning. My family took me to Bethlehem. At an Israeli checkpoint, we saw a group of Palestinian youths gathered throwing rocks at the Israeli guards. There was an increase of guards around. I saw the guards shooting back tear gas and was in shock. My family didn’t seem affected at all. This was totally normal for them. We had to take a really long, backroads way to get to Bethlehem because the quick, normal way is really difficult for Palestinians. It is common for Israelis to refuse them entrance into certain areas, even though it’s all the West Bank, so they’re always afraid of having to turn around (which also affects the kids, because imagine being really excited for a trip and then being told you aren’t allowed in). Also, my aunt and uncle told me their kids love these trips but are hurt because they rarely ever get to – that’s how much of a nightmare it is for Palestinians to travel even within their own land. Anyways, Bethlehem – incredible. 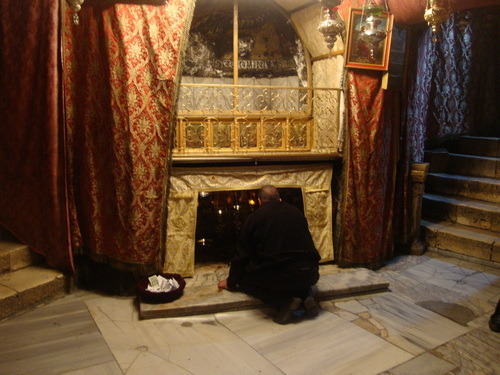 The Church of the Nativity – beautiful. 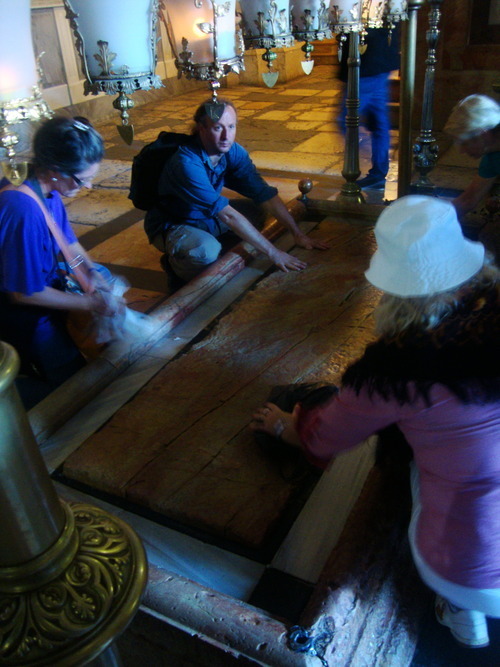 The spot Jesus was born was so sacred and I almost wanted to cry. That’s where my Savior physically came into our world. So amazing. 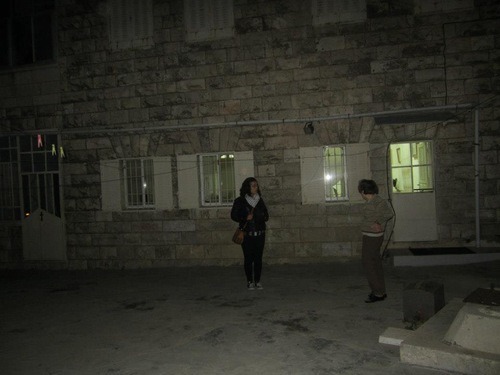 We didn’t get to spend too long in Bethlehem for fear of more issues at the checkpoints. On our way back the soldiers and youth were still there, this time lighting things on fire on the sides of the street. We also found out that day there were protests and riots in the exact same spot we had visited in Jerusalem just the day before. Mainly spent the day around Ramallah. I loved this city. My aunt also took me to see the house my grandma and grandpa lived for 15 years, before having to escape it (forever) in 1967 because of the war. Though my dad’s side of the family is Palestinian, this set of grandparents in particular are actually Jordanian but lived for a time in Ramallah (including my mom up to age 4). The current owners of the house allowed us inside to see it, and seriously it literally just felt so surreal. I imagined my grandma and late grandfather walking around, cooking, hanging the laundry outside, my mother and her siblings running around, etc etc. It was really such an incredible honor to have been there. To this day I am the only one in my family who has been able to see this house, as none of them have been allowed back. 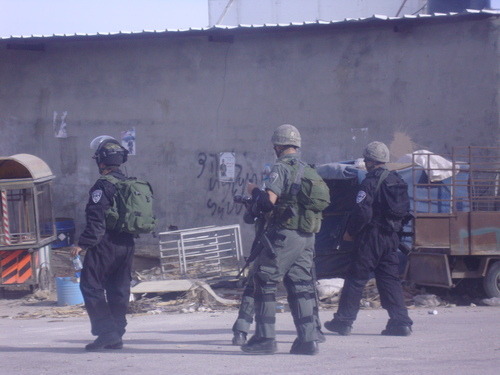 We also found out that day there were protests and riots in Bethlehem, where we had been just the day before. Left back to Jordan. The border on the way out is really easy. God blessed me with people to help me – at first, two Palestinian girls, and then two Palestinian guys who, not only did they voluntarily carry my really heavy bag between all four or five of the buses that we had to take (you hear that, Americans), but also gave me a free ride home all the way from the border to my place in Amman. They were children during the two intifadas Palestine encountered (1992, 2002), and told me about their experiences witnessing Israelis barging into their neighborhoods and killing people right before their eyes. Again, I was in shock hearing these stories. To them, it’s “a3dee.” Totally normal.